"The dog bit out of nowhere!" Don't be fooled into only worrying about the breed that made the news, believe that asking the owner is safe enough, and betting on your own family dog having endless tolerance. Be proactive and have your child learn safer, up-to-date ways to "be" around dog's. The Be A Star program is designed to educate children (pre-Kindergarten and older) on dog safety and how to show love to dogs in ways dogs appreciate. These learned, safer behaviors then go with them during sleep-overs, while walking to school, or playing at the park. Learning is a reward based system that incorporates a realistic, stuffed dog. 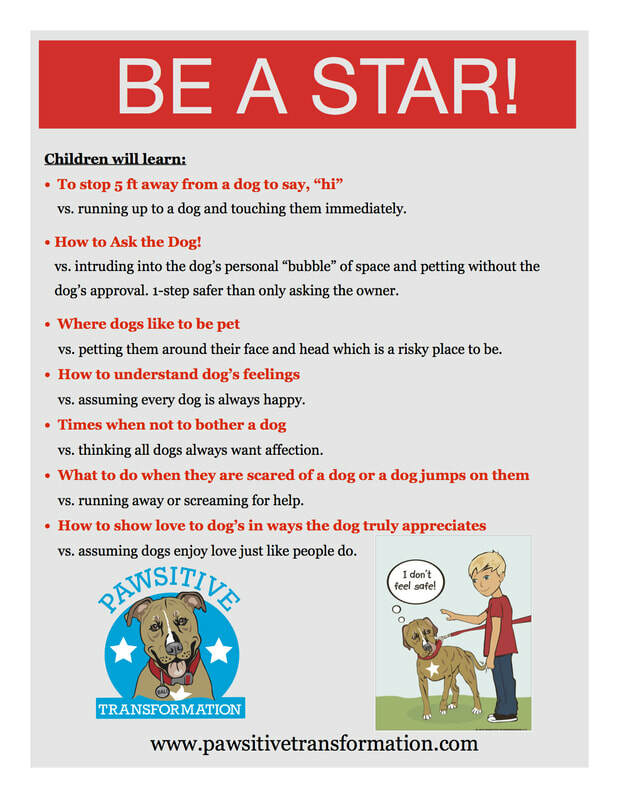 The Be A Star program is a small collection of intensive learning sessions designed to ensure your child learns the key components of being safe around all dogs. No two children and no two family situations are the same, which is why these learning opportunities are customized and paced to your child’s specific situation and personality. Each session (generally around 30 minutes) is meant to be completed with as much attention focused as your child can give, so Jennifer asks that it is scheduled on a stress free day, with personal time available afterwards to allow them to reflect and retain the information they have learned. Multiple sessions are needed to have your child learn the entire program and retain all vital information through practicing in a safe, professionally guided environment. Be A Star can take place in your home, a park-like setting, child-care facility, or school. $ 40.00 for 30 minutes. Group discounts available.